Iquitos is located in the midst of the great Amazon plain, almost entirely surrounded by three ocher-colored rivers: the Nanay, the Itaya and the Amazonas. The only way to arrive in Iquitos is by air or river. A boat trip from Iquitos takes us to the fascinating diversity of the jungle flore and fauna and the mysteious beauty of the forest. We travel throuthout the Amazon and the Nanay river for aproximately 2 hours. 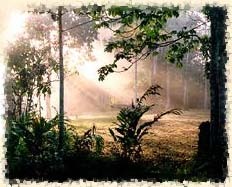 To better experience the teaching of the forest we stay in the heart of the jungle for two days. In the jungle all the animals live together in harmony, as you can see the birds, a cat, and the monkeys are sharing their meal as if they are all a part of the same species. We (humans) definitely have a lot to learn from them. Part of the reason we travel to the jungle is to learn from the natives who are open to share their way of life with us. The Boras and the Jibaros are always friendly and embrace our groups by sharing their music, wisdom and artcraft with us. The Jibaros are the only tribe of South American Indians that have successfully revolted against the empire of Spain. Jibaro Medicine Man Any of you who are familiar with Michael J. Harner know that Harner learned a great deal about shamanism from the Jibaro people. They are not a warlike group, but are an individualist people intensely jealous of their freedom. The Boras love to receive us in their village and always welcome our groups by singing in their native language and dancing for us. It is their costum to invite guests to dance with them and it is considered an offense if an individual does not accept their invitation.